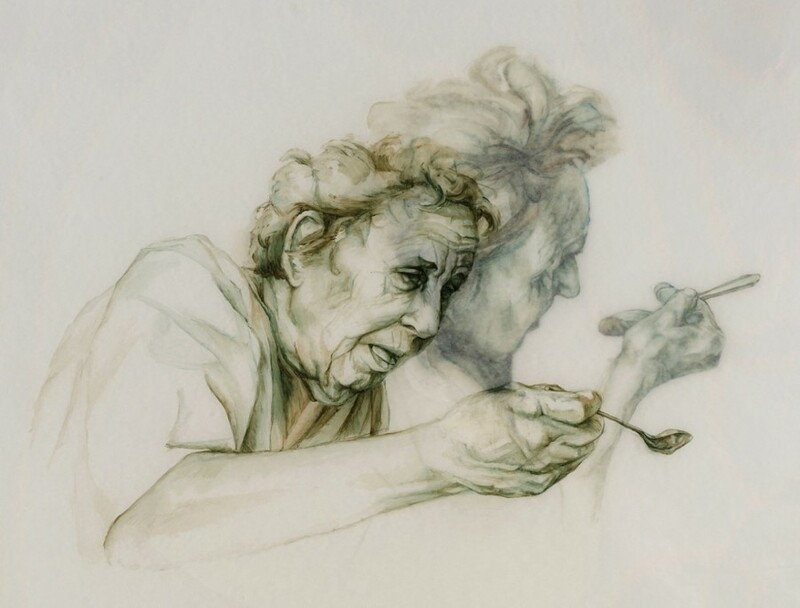 Porterfield’s drawings are influenced by her work as an occupational therapist and her interactions with patients and their caregivers. In painting on transparent, glassine paper, she progressively layers her images to address reoccurring struggles in healthcare that are outwardly hidden or forgotten. With her grandmother as her model, she hopes to convey the loss of identity that can occur as degenerative illnesses affect one’s ability to complete self-care or functional movement. The underlying layers represent the obscured sense of self that attempts to overcome those difficulties. Porterfield has exhibited both nationally and internationally at venues including the Lim Lip Museum in South Korea, the Phoenix Art Museum, the San Diego Art Institute, the Hyde Park Art Center, the Kohler Arts Center, the Ukrainian Institute of Modern Art, the Rockford Art Museum and the Koehnline Museum. Solo shows have included the Packer-Schopf Gallery (Chicago, Il), the Great River Road Museum of Contemporary Art (Ptosi, WI), the University of Illinois (Urbana, Il) and the West Valley Art Museum (Surprise, Il). Honors include three Illinois Artist Council Grants, a Puffin Foundation Grant, and three Chicago Community Arts Assistance Program Grants. Porterfield teaches at Northeastern Illinois University and received an MFA from Arizona State University. Gallery hours are Monday-Friday, 1-4pm. Opening reception is Tuesday, November 13 from 1-3pm. For further information, please contact the IU-NW Department of Art at 219-980-6891 or visit their facebook page at: IU Northwest Arts and Engagement. This exhibition is sponsored by a grant from the Illinois Arts Council Agency.